Filled to the brim with exciting attractions and places to visit, New York is a great place for those looking to see a lot in a short space of time. With museums, Broadway shows, world famous monuments, and so much more, visitors have an incredibly wide choice of things to do. This scenic city centre, perched alongside the curving beaches of this vibrant island, is the precious gem of St. Kitts. Basseterre is a lively capital with never-ending activities and attractions to offer its visitors, from volcano crater hiking to dining in style. Located on the sunny island of Saint Lucia in the Caribbean, Castries boasts an impressive range of attractions; from water sports activities bound to attract sports enthusiasts, to galleries and workshops showcasing the locals' talent. Capital and largest city of the twin-nation of Antigua and Barbuda, St John’s is located on the 108 sq-mile island of Antigua. Filled with colourful colonial architecture, the city is a sight to behold. As the largest of the three, St Thomas is probably the better known of the US Virgin Islands. As expected from an island, it has a lot of beaches, most offering watersports activities. Those looking for something else might want to try the Gallery Camille Pissarro or the Fort Christian & Museum. Perfect for a romantic getaway, guests will fall head over heels for these fabulous Penthouses. Each accommodates up to four and feature a bedroom with queen-size bed and luxury bath and shower. In addition, they also include a living area, dining area and large private balcony. Butler and concierge service are also included. These Penthouses are perfect for the whole family. Up to six guests can stay in these luxurious Penthouses that include a bedroom with a queen-size bed and a separate children's bedroom. In addition, they also feature a living area, dining area, private balcony and luxury bathroom with separate shower. Includes butler and concierge service. These Courtyard Penthouses make for an amazing cruising experience. Accommodating up to three guests, they include a bedroom with a queen-size bed, a bathroom with luxury bath and shower, and additional bedding to sleep one additional guest. They also feature a living area, dining area, private balcony and access to the private courtyard area. Includes butler and concierge service. Up to six guests can enjoy these Villas that are perfect for passangers bringing kids. They feature one bedroom with a queen-size bed and a bathroom with a luxury bath and shower, as well as a separate children's bedroom. They also include a living area, dining area and private balcony. Guests staying in these rooms will also have access to the private courtyard area. Includes butler and concierge service. These Owner's Suites are a truly luxurious way to get away. Each includes a separate bedroom with a king-size bed and luxury bathroom with separate shower. They also feature a living room, dining room and large private balconies with incredible views. Accommodating up to four, guests staying in these rooms have access to the private courtyard area. Includes butler and concierge service. These amazing Villas sleep up to eight with three separate bedrooms, each with a king- or queen-size bed and luxury bathroom. With a living room, dining room and incredible private garden with hot tub, guests will have more than enough space to spread out and unwind. There's also access to the private courtyard area. Includes butler and concierge service. Up to four guests can stay in these Mini-Suites that come with a sitting area, luxury bathroom with shower, two lower beds that convert into a queen-size bed and additional bedding to sleep two additional guests. Not to mention there's a private balcony from which to enjoy the incredible view. Up to four guests can stay in these Oceanview Staterooms. Includes two lower beds that convert into a queen-size bed and additional bedding to accommodate two more, as well as a porthole to enjoy the view. These staterooms are mid-ship accommodations, which means they provide easy access to everything onboard. These Oceanview Staterooms have enough room for up to four guests. Includes two lower beds that convert into a queen-size bed and additional bedding to accommodate up to two additional guests. Guests will also have an amazing view to enjoy from a big picture window, along with room service and many more amenities. These Inside Staterooms are the most affordable way to cruise. There's room for up to four guests and they include two lower beds that convert into a queen-size bed and of course, offer room service and many other amenities. A first class dining experience in the grand tradition of the luxury ocean liners of yesteryear, Grand Pacific offers beautifully crafted contemporary and traditional dishes prepared with only the freshest ingredients. Plus, with Chef's Signature Dishes and a Chocoholic Night available once per sailing featuring specialty chocolate-based desserts, this Main Dining Room guarantees an amazing foodie experience. Balancing classic favorites with the hottest new dishes, Alizar is a can't miss culinary experience. With daily changing menus offering even more variety and Chef's Signature Dishes featuring deliciously fresh ingredients, there's always something to look forward to inside this Main Dining Room. This is the place to hang out, 24/7. Serving up Irish/American classics in a relaxed, pub atmosphere, O’Sheehan’s is a guest favorite. For great sea views, grab a bite and enjoy the warm ocean breeze poolside at this lively grill. Flying shrimp. Onion volcanoes. Twirling knives. The sizzles and surprises never cease at the authentic Japanese Hibachi restaurant. Sit around a lively shared table as a skillful chef slices, chops and grills steak, seafood and chicken on a large steel grill right before your eyes. The chilled, sake-infused Wasabi Cocktail will have you flipping too. Topsiders is located on deck near the Sapphire Pool and offers a full bar and grill in close proximity to ample sun beds and two hot tubs. Think of it as a total resort experience in itself. 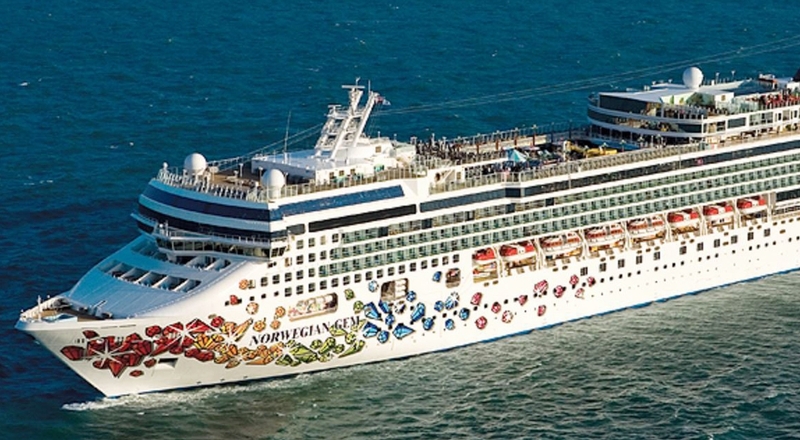 The ocean's very first Pizza Delivery Service is offered 24 hours a day aboard Norwegian Gem. Th Pizza Team is happy to deliver a piping hot, homemade pizza with your favourite toppings directly to your table, your stateroom, or your favourite bar or lounge. Just ask your server or call room service to place your order. "Fresh and Freestyle, that’s Pizza 24/7." Casual Italian eatery reflecting a village Trattoria or traditional farmhouse kitchen. Ornate French restaurant inspired by the colors, planting and artwork of the Pacific Islands. If you’re looking for a unique experience, the authentic Brazilian steakhouse is a must. Start with an impressive salad bar of imported cheeses, olives, cured meats, ceviche and specialty salads. Be sure to save room for the delicious skewers of slow-roasted meats including beef, pork, lamb and chicken – all carved tableside by the Pasadores. As the succulent skewers of barbequed meats are carved tableside, you control how much you want with the Moderno Green and Red Chip. Green for go and the carving continues or red to stop. Also, enjoy a wide selection of perfectly prepared salads, sliced meats and traditional accompanying dishes from the salad bar. Steak is the standard at the American-style steakhouse. Select from choice cuts of Black Angus perfectly prepared like traditional T-bone or tender Prime Rib. Your mouth will water, so sip your favourite cocktail in anticipation. And don’t forget to order the made-from-scratch jumbo crab cakes and a side of the famous truffle fries. Our buffet serves up complimentary breakfast, lunch and dinner - and the floor-to-ceiling windows provide picturesque ocean views. Action stations include meat-carving, made-to-order pastas, omelettes, waffles, soft-serve ice cream and more, including speciality dishes from around the world - satisfying your every craving. A spacious outdoor buffet with many choices that will surely keep you coming back for more. In the mood for sushi? Pull up a stool at this contemporary sushi and sashimi bar for some traditional Japanese culinary bites. A la carte pricing applies. An 18% gratuity and speciality service charge will be added to your check. Horizontal windows in the floor allow you to look down on the bridge. At night, the atmosphere is charged when the music comes up and the stage becomes a dance floor. Two adjoining rooms are available for parties. Inside the Lotus Garden Restaurant there is also a Sushi and Sake Bar where you can enjoy the very best sushi and sake expertly prepared as you watch. For that double, vanilla, extra hot latte with extra foam, the Atrium Café is at your service with a wide variety of specialty coffees, teas, pastries and cookies. Some moments just call for champagne. And this is the place to enjoy it. Magnum's features a French Art Deco motif combined with elements that reflect the grand old cruise liner Normandie. Inspired by the lobby bar from the Mandarin Oriental in London, this contemporary full bar has low lounges and tables with the perfect hint of mood lighting. How do you like your martini? Shaken, not stirred? The bartender will make a point of knowing exactly what you like at Shakers, where Art Deco meets the making of cocktails. Full Casino featuring a circus theme reflecting bold and brash colours of traditional traveling circuses at the turn of the century. It's showtime! And we've got a really big show for you at the Stardust. Enjoy Broadway and Vegas-style shows. Need a new bathing suit? How about a surprise gift for a loved one? The Galleria is a department store that offers a wide selection of brand names and speciality goodies. No matter how far you are from home, staying in touch is easy at the Internet Café. You'll find a well-stocked selection of things to read, along with a stellar ocean view. A lounge inspired by all things spherical and out of space. Bubbles, the use of lighting, color and ultraviolet artworks will be throughout this room. Features the industry's 1st bowling alley and also is equipped with TVs. The kid's pool is just right for pint-size splashing, playing and paddling. The pool also has additional fun features. Upgrade to Free at Sea for £149pp. Choose 2 Offers from the list below. Book a suite and receive all applicable offers at no additional cost. Enjoy 4 dining opportunities in selected speciality restaurants.